Glorious! (subtitled The Worst Singer in the World) tells the true story of Florence Foster Jenkins, an American socialite, active in the early part of the twentieth century. A woman of sufficient means, following her family inheritance, and therefore able to fulfil her dreams, large scale, of bringing her "magnificent" voice to the masses. It's quite a story, which were is fictional, you might baulk at its believability, but here in this play by Peter Quilter, it not only becomes joyful and uplifting but often uproariously funny. 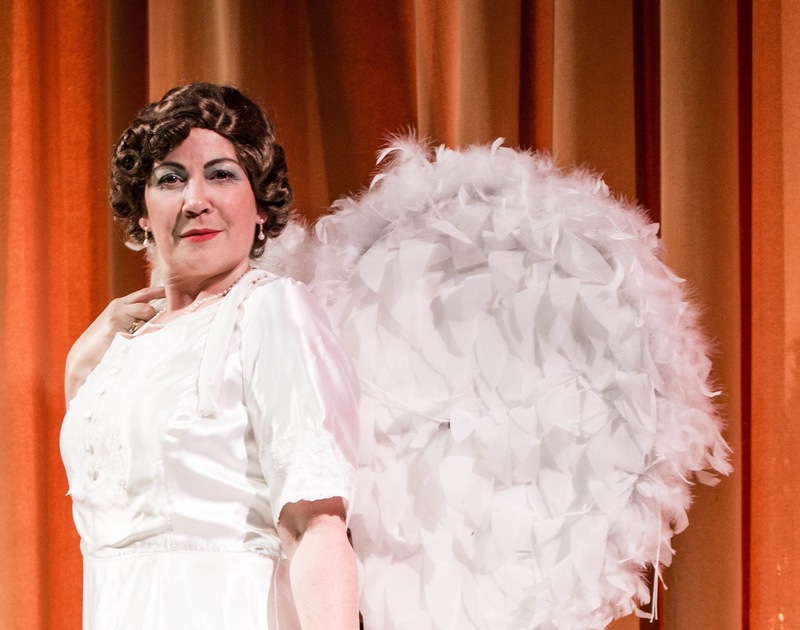 As Florence, Kate Billingham executes a masterclass of comedy delivery, most especially realised in the musical performances. In the kindest possible way, this is singing of the most ear bleeding quality, and delivered with nuances of facial expression of magnificence. The naivety of Florence is also nicely created from Billingham's performance, bringing forth her belief that she truly is the best singer in the world. There is much depth there, despite this script being written for laughs much of the time, it leaves a deep sadness, yet hope at the end as well. We can't perhaps all follow our dreams, life doesn't always allow that, but at the end of the play, we perhaps can experience what it is like to be able to follow them through Florence, and maybe think a lot harder at trying to make ours come true. Playing almost everything deadpan alongside Florence is Richard Jordan as her pianist Cosme McMoon. As he sits at the piano, sobbing inside, we live the pain of the singing through his expressions. Elsewhere, his timing of delivery is top notch, making this one of the best performances I have seen from him, close to that of the devastatingly brilliant Scaramouche Jones. His silent reaction to the Cole Porter pansies line is quite brilliant, as it's much of his silent exchanges. I delight in praising actors when they are not actually delivering lines, and here in that respect, Jordan is exceptional. There is also a tremendously well-played moment when McMoon is confronted by Florence's revelation that he shared a cab home with a gentleman. The hidden depth of this scene is not overplayed in any way, and all the more poignant in that respect of the difficulty at the time. Fraser Haines is also at the top of his game as Florence's boyfriend St Clair Byfield, again perfectly cast (as is everyone in this production), and able to demonstrate his delightful plum delivery, direct from Bognor Regis no less. Kimberly Vaughan has great fun as Florence's best friend, more than willing to have a drink or three and always accompanied by her delightful poodle, who creates much mirth as well. There is a brilliantly ridiculous performance by Victoria Miles as Mexican cook, Maria, who despite one rather obvious "Qué" moment that the knowing audience runs with, successfully avoids too much comparison to a certain Spanish waiter. It's true that Maria is really just a one-joke character, and little else, but credit to Miles that she always still manages to make her a hugely entertaining one. Finally, despite only a relatively small role, Lynne O'Sullivan creates a fun addition as Mrs Verrinder-Gedge, an apparent lone voice against the travesty of music that she sees in Florence. This whole production plays out on a gloriously constructed set from Rod Arkle, looking everything the 1940s world should embody. It also has many neat tricks to evolve through a few scene changes of three or four minutes. Regular readers of my blog would feel alarm bells striking soon, with mention of such long scene changes, however, here in Glorious! they become brilliant little creations of their own, as Arkle himself and Bernie Wood bring characters to life with their own silent story as they change the set, also capturing the moment in the story that the scenes are changed with relevant emotional changes. They are substantial changes it has to be said, but, if it's got to happen, this is the way they should be done, and I admit that I almost got emotional about how well they were executed. Glorious! came as a surprise to me, knowing little ahead of seeing the show, but in the end, it struck me as a heartwarming tale, loving of its main character despite everything, and full of many truly funny lines. Director Ian Spiby has masterminded for me my favourite White Cobra Production that I have seen, with a cast of immense ability and this time occupying every role perfectly. It's difficult to say how much I truly enjoyed this show, but those few hundred above have hopefully expressed it with the style that Florence sings.